Welcome back, my Cutting Edge Stencils friends. Do you have an old trunk laying around? 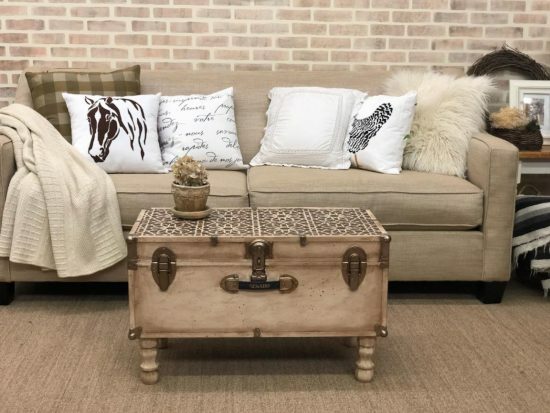 Now is the perfect time to transform that old trunk into a farmhouse-inspired coffee table. 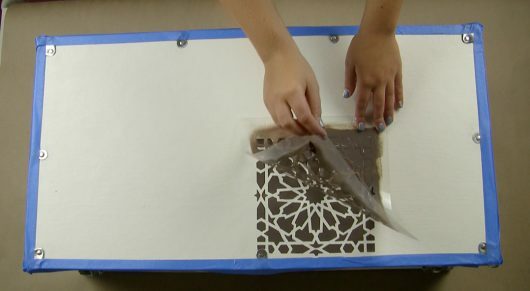 All you need is a little paint and a fun stencil pattern. 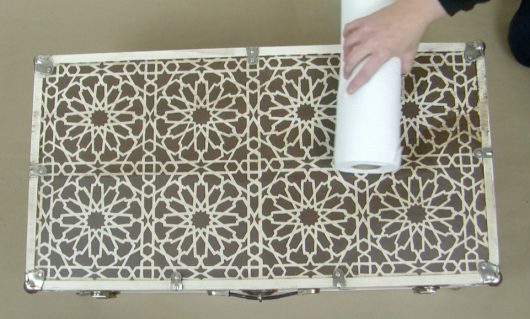 Come see how we used the Moroccan Magic Tile Stencil to update a vintage trunk. Let’s welcome back Erika, our in-house craft guru. 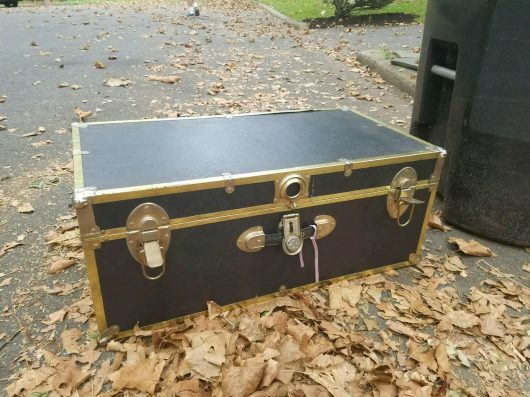 Erika was walking her dog one afternoon when she spotted this old trunk sitting in the trash. Watch this quick video tutorial about this furniture flip project. Let’s walk through this tutorial. Here is the trunk before. It was beat up but still functional. Erika’s DIY wheels started to turn and she scooped it up. The first thing she did was cleaned it off. 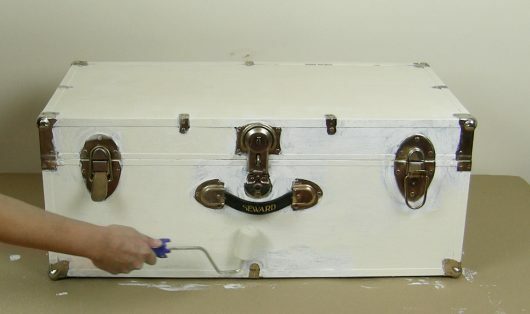 Then Erika primed the trunk using STIX primer. 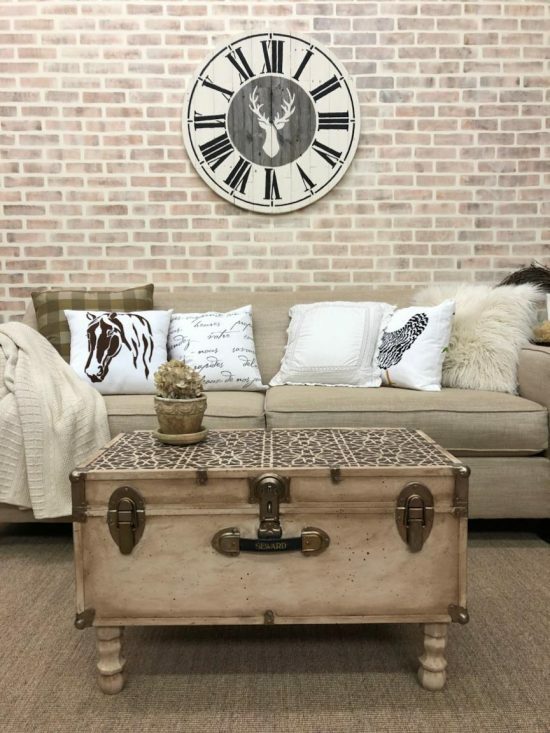 Erika’s plan was to give this old trunk a farmhouse style spin. She painted it using small 2″ dense foam roller in Benjamin Moore’s Navajo White. To add character to this piece, she planned on stenciling the top. 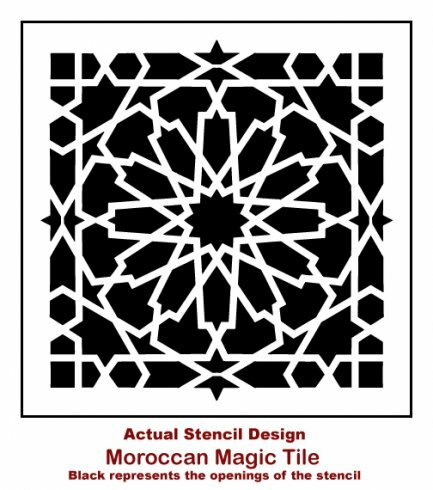 For this project, she chose the small 12″ Moroccan Magic Tile Stencil. This pretty pattern is geometric spin on popular Moroccan designs. Erika applied spray adhesive to the back of the stencil. We like to use Sticky Note spray adhesive which can be purchased on Amazon. 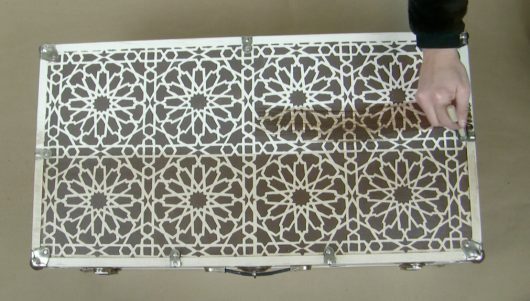 Then she centered the Moroccan Tile Stencil on the top of the trunk. 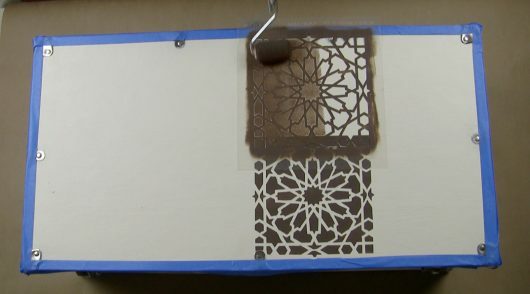 For the stencil color, Erika used Benjamin Moore Brown Horse. She used a 2″ dense foam roller to paint the pattern. She made sure she rolled off any excess paint on a piece of paper towel. Too much paint will cause the design to bleed. Then she painted the entire pattern on to the trunk. 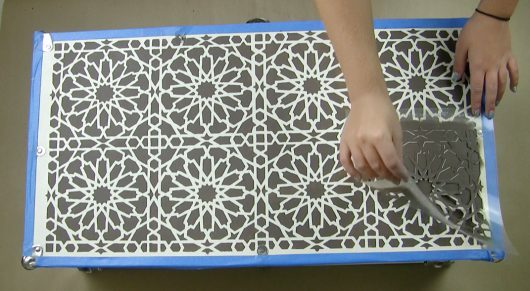 Once the entire design was painted, Erika lifted the stencil back to reveal the tile pattern. Impressive, right? To continue the pattern across the top of the trunk, Erika lined it up and repeated the painting process. To complete the farmhouse look, Erika decided to age the trunk using a brown glaze. 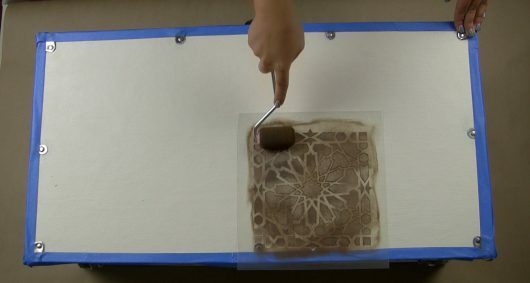 She used a small chip brush to apply the glaze and a roll of paper towel to remove the excess. Glazing can be a lot of fun. You can add as little or as much glaze to the piece as you like. 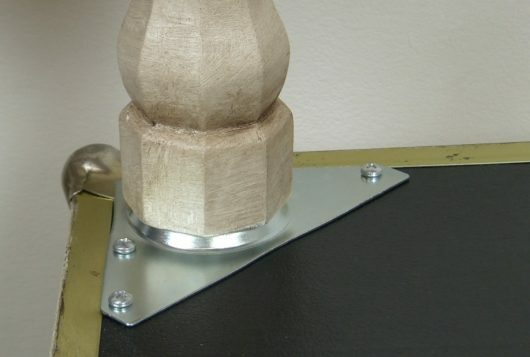 Erika purchased small wooden coffee table legs from Home Depot. She painted and glazed to match the rest of the trunk. Then she followed the directions to attach them to the trunk. 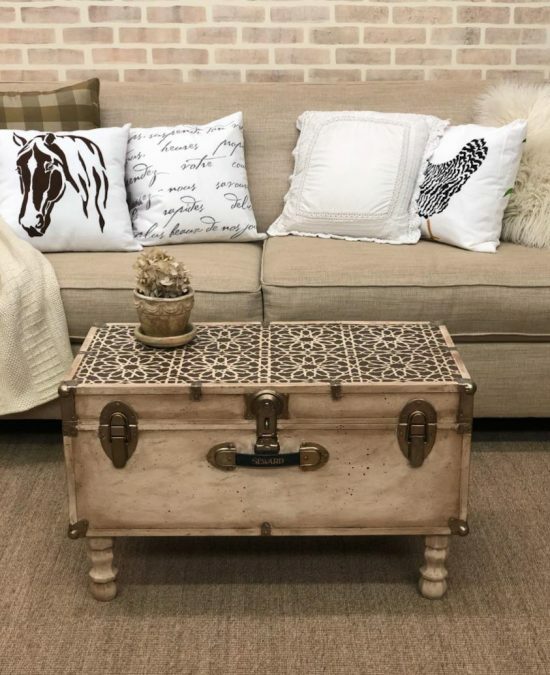 Are you ready to see how Erika’s stenciled trunk makeover turned out? The Moroccan tile pattern adds interest to this farmhouse-inspired trunk table. It’s hard to believe that she snatched this old trunk out of the garbage. It looks amazing now. Tell us, where would you use an Art Deco stencil pattern in your home? Leave us a comment below, we’d love to read your thoughts!